Parental knowledge of their students’ backpack weight and contents was assessed by identifying 188 students who carried backpacks weighing at least 10% of their body weights through a survey of 745 students in three elementary schools. 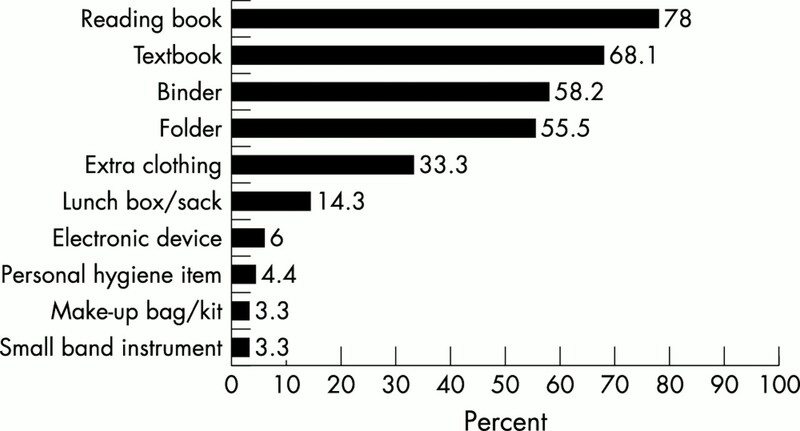 Most parents (96%) had never checked their child’s backpack weight; 34% had never checked the backpack contents. Backpacks represent a common consumer product in our modern school system. However, their use may not always be without some adverse health effects. Every year school age children make more than 10 000 backpack related office or emergency room visits in the United States.1 In a study of 11–13 year old children, Pascoe et al showed that the daily physical stresses associated with carrying book bags on one shoulder significantly altered children’s posture and gait.2 While schoolchildren carry these heavy, one size fits all backpacks, it is uncertain that all the items would be needed on the days the backpacks are carried to school. Yet, one wonders how many parents ever take the time to check the weights or contents of these backpacks. We designed this study to assess parental knowledge of the weight and contents of their elementary schoolchild’s backpack. Subjects included 188 students in grades K-5 attending three elementary schools in Central Texas, who carried backpacks that weighed 10% or more of their body weights. The study was approved by our Institutional Review Board. Area school principals were contacted to solicit their school’s participation. All students enrolled at three schools whose principals consented to participate by approval letters were included. However, only 4th and 5th graders participated in school B. Of 1327 students enrolled in the three schools, parents of 745 (56.1%) provided written consent. Data were collected on predesignated days blinded to the students. The weight and height of each child, who returned a written parental consent, were determined along with their backpack weight, demographic data, and type of backpack. Students whose backpacks weighed 10% or more of their body weights were surveyed further to obtain additional information, including backpack contents and whether any parent had ever weighed their backpack or checked its contents. To assure quality, the survey instrument was pretested, only calibrated weighing scales were used, the research staff were given intensive training on measurements, and the same person filled out the survey forms at each particular school to reduce interviewer variability. Descriptive analysis was performed to determine point and interval estimates. Correlation between parental checking of backpack contents and weights was assessed using the non-parametric Spearman’s rho statistic. Group differences (for example, children whose parents had never checked their backpack versus those whose parents had checked their backpacks) were assessed for statistical significance using Student’s t test, the χ2 test, or Fisher’s exact test. No multivariate analysis was performed because of small numbers. Statistical significance was set at α = 0.05. The final study participants included 65 (35%) students from school A, 60 (32%) from school B, eight (4%) kindergartners, 13 (7%) 1st graders, nine (5%) 2nd graders, 20 (11%) 3rd graders, 61 (32%) 4th graders, and 77 (41%) 5th graders. The majority (58%) were girls and were white (67%). The mean backpack weight was 4.9 kg (range 1.9–13.5 kg; SE 0.14) and represented an average of 14.4% of student body weight (range 10.0–37.4%; SE 0.33). The most common item carried in backpacks was a reading book. The backpacks also contained a mean of 1.5 (SE 0.09) textbooks and 1.1 (SE 0.12) folders. Additional items included extra clothing, lunch boxes, and electronic devices (fig 1). Reported contents of elementary school children’s backpacks; Central Texas, 2001. Sixty three (34%) students reported that no parent had ever checked their backpack contents; only seven (4%) parents had ever weighed their children’s backpacks. Students whose parents had never checked their backpack contents carried significantly heavier weights (mean 11.8 v 10.2; p = 0.011) and more textbooks (mean 1.7 v 1.3; p = 0.036). However, no significant difference was seen between the two groups regarding the ratio of backpack to student body weight (15.2% v 14.0%; p = 0.09). A very low correlation existed between checking backpack contents and weighing the backpacks by parents (rs = 0.025; p = 0.73). This study has shown that the majority of parents, whose children’s backpacks weigh 10% or more of their body weights, do not know the backpack weights or contents. Paradoxically, many of the published reports on backpack safety have focused on older children, adult use in the work place or for recreational hiking, and military personnel.3–5 Few reports have focused on young children.6 It is easy to underestimate the large supply demands required of children in our modern educational system. Carrying a day’s worth of books, supplies, gym clothes, and the myriad of items treasured by children for many hours is a difficult task. Definitely, an experimental trial is what is needed to assess the influence of parental knowledge on backpack loads or related symptoms. Our findings are also limited by the small number of public elementary schools used and the fact that data on items carried in the backpacks and parental knowledge were based on self reports. Nonetheless, we believe that there is a need for a targeted primary prevention programme on school backpack safety. Parents remain the best advocates for safety promotion and should represent the group most likely to help to significantly reduce the number of backpack related injuries—by checking backpack weights and contents. A second line of prevention should focus within the school. If children are required to keep backpacks in lockers and allowed more time to move from class to class, a number of potential injuries may be averted. Currently, many professional organisations are communicating virtually the same message: choose the right size backpack; pack well and empty out unnecessary items; wear straps on both shoulders; and carry less than 20% of body weight. However, the message needs to be packaged in a way such as using an acronym that children will easily remember. One such acronym has been developed by one of the authors (SNF) as backpack safety SKILLS, and is going to be used for educational purposes in the Central Texas area (table 1). We thank Kim Johnson for assistance with study design; Saundra Mason for coordinating data collection; and Marcine Chambers, Jennifer Dew, Harriet Forjuoh, Theresa Gaines, Hope Gonzala, Chris Herrick, Sonia Holleman, Lisa McMahon, Teresa Powell, Bryan Wulbrecht, Melody Rainwater, and Linda Teer for data collection. Karp J. Overstuffed and misused backpacks cause problems for schoolkids. Biomechanics2000;November:21–8. Pascoe DD, Pascoe DE, Wang YT, et al. Influence of carrying book bags on gait cycle and posture of youths. Ergonomics1997;40:631–41. Grimmer KA, Williams MT, Gill TK. The associations between adolescent head-on-neck posture, backpack weight, and anthropometric features. Spine1999;24:2262–7. Shoenfeld Y, Udassin R, Shapiro Y, et al. Optimal backpack load for short distance hiking. Arch Phys Med Rehabil1978;59:281–4. Knapik J, Reynolds K, Staab J, et al. Injuries associated with strenuous road marching. Military Med1992;157:64–7. Negrini S, Carabalona R, Sibilla P. Backpacks as a daily load for schoolchildren. Lancet1999;354:1974.